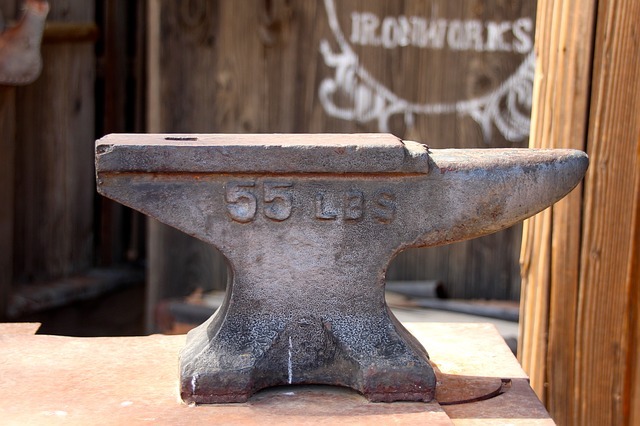 Anvil is a large and heavyweight metallic block used in metalworking. an anvil is a key tool in the forging process. in metalworking, anvil provides the base to a specimen. during the forging process, the workpiece is to put on the anvil and the hammer is used to deliver sudden impacts. Anvil has a flat surface where the workpiece is placed. Anvil is a dense metallic, high strength, high toughness, and high endurance tool. It has to resist high pressure and sudden impacts applied to it. there are different parts of the anvil with different purposes. 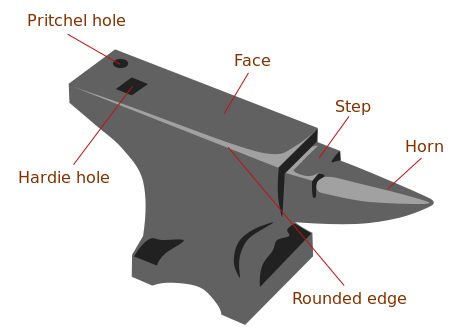 Anvil face is the primary surface where most of the job work is done. anvil face is generally made of hardened steel. it has to resist most of the load or pressure applied to it. the tampering of the anvil is done to make it tougher. the material of higher strength and higher toughness than the material of anvil face should not be used as it can damage the Anvil face. so the materials like hardened Steel, cast iron should be avoided. Horn is a part of anvil placed near to the face. It is a cone-shaped part used for spherical or round shaped works. Horn is a necessary part of bending processes of a metallic rod. Horn is a placed parallel to face which is separated by the step. There is an area between the face and horn that called Step. The separation of face and horn prevent the damage of one another part when an operation is going on. When Horn is being used it may affect the face and vice-versa. But step prevent it. The step is also useful for cutting purposes. the base part should be such that it does not displace from its position when high pressure is applied to it. that's why the base of high strength to weight ratio is required. Sometimes the wooden base is used in the anvil. it is a square hole into which certain tool can be placed. these tools are used for forming purposes such as punching, bending etc.